Bones are the base of our body – providing structure, protecting and holding organs, muscles. 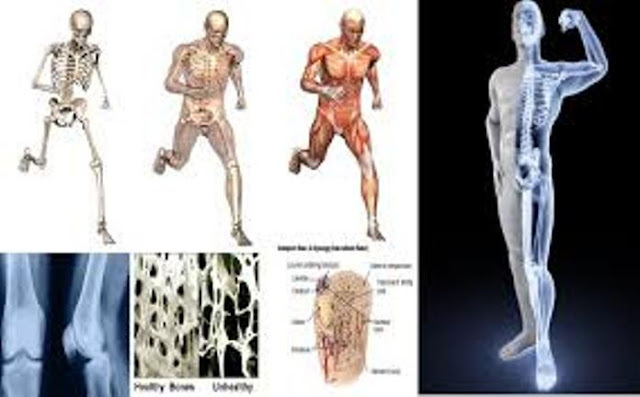 Without bones many of our vital organs will be exposed and vulnerable. Can you imagine our heads with no bone, NO! Simply bones play crucial part in our existence. Bones are also vulnerable and there are many diseases relating to bones. That’s why we have to take care of our bone’s health. We have to make and keep them strong and healthy and there are many ways to achieve this. Our bones store 99 % of the calcium and 85 % of the phosphorus in our bodies. This means we have to intake food with plenty of calcium in order to maintain our bones in good condition. Different food consumption with low levels of calcium can lead to bad bone health. Calcium is a mineral most that helps you build and maintain bone mass. Calcium is widely best known mineral. Strong and dense bones are achieved with consuming enough calcium on a daily basis. This is very important as you age, because you lose some bone density over time, but calcium helps against bone loss. Good sources of calcium include: soy milk, reen leafy vegetables (broccoli, brussels sprouts, kale), beans/legumes, sardines, orange juice (calcium fortified), bread, almonds, dairy products (milk, cheese, yogurt). Our bodies also need vitamin D to retain and absorb the calcium mineral. Vitamin D likewise is an important part in bone structuring, advancing the action of osteoblasts, the cells that store new bone tissue. Good sources of vitamin D: oily fish (tuna and sardines), egg yolks, liver, and milk with vitamin D. Sunlight also contributes to the body’s production of vitamin D.
Weight-bearing activities, for example, strolling, running, tennis and climbing stairs, can help you strengthen bones and slow down loss of bone. Do not smoke and if can’t stop try to smoke less as much as you can. Also avoid drinking more than two alcoholic beverages a day. Note: If bone health is at risk factors for osteoporosis, including a recent bone fracture, consult your doctor.